Garage organization presents some unique challenges: how to pull together cars with toys, tools, sporting equipment, beach chairs and cleaning supplies? In one space? Luckily, 3 professional organizers Mary Hoff (Lotus Organizing & Design), Donna Jumper (JumpStart Organizing) and Lisa Mark (The Time Butler Professional Organizers) are on board to help guide us through the 5 steps of the organization process. Every household stores things in their garage they shouldn't. "Usually there is just too much of everything and it becomes a dumping ground for all kinds of things," says Jumper. So if you've accumulated massive amounts of clutter, you are not alone. And take heart, chances are your garage has nothing on what these pros have seen while organizing client's garages: dead and live animals, spoiled food, photographs ruined by moisture, termite-infested furniture that never made it to the dump — the list goes on and on. Catch-all basket for odds and ends. Any evidence of furry or winged creatures that may have taken up residence in your home. “You can organize a garage a bit at a time or even a wall at a time," says Hoff. In other words: choose a corner of the garage to start with, or choose a type of item (beach, sports, small tools, etc.) and declutter slowly. 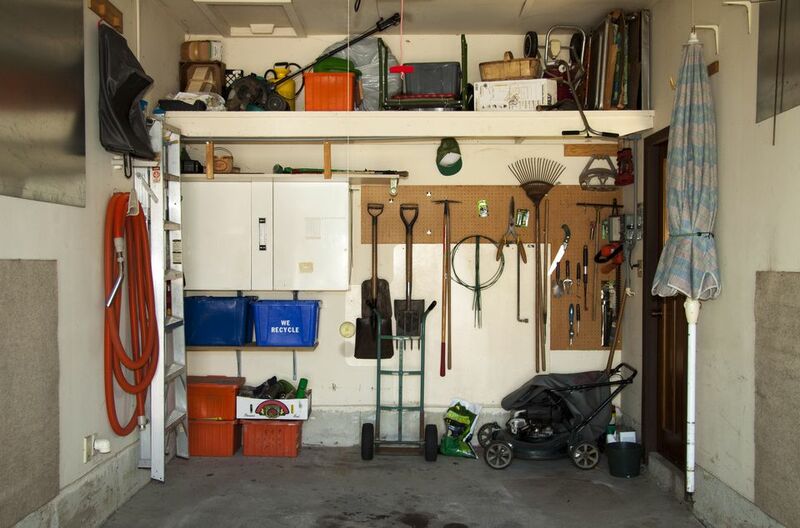 Because so many different types of items are stored in a garage, all 3 pros recommend organizing in zones. Begin by grouping like items with like items. Car supplies (windshield wiper fluid, anti freeze, etc). With this zone concept, you can think as small (3 basic zones) or as big as you need to. Says Mark, “My favorite garage project was for a client who wanted her small garage divided into 7 zones: an exercise area, a holiday storage system, a spot for off-season clothing storage, a laundry zone, an area for general storage for items that would not fit into her downsized space, a workbench for her husband, and a home office." Start with the basic 4 zones above and then work outward from there. Once you have everything sorted, begin assessing how much space each zone is going to take up, and then plan accordingly. For instance, if you need a "beach gear zone," you can easily create one once you have gathered your beach items together and have a sense of how much room it will require. Make sure and dangerous items (chemicals, tools) are stored in a locked cabinet if children are in the house. Here's what NOT to do when planning your garage storage: Buy an organizing system and then install it and see if fits all of your stuff. I recommend you take a conservative approach to storage planning. Start with some basic garage organizers, like shelving and a good step stool. Work with the basics and then expand out as you see fit. Once you’re organized your zones, you will feel a well-earned sense of accomplishment. Step 5 is to keep this organizing scheme going by doing a quick sweep as often as you need to: Seasonally, monthly or even weekly. Garages are a high traffic area so the more often you organize this space, the less time it will it take. Says Hoff, "Just like any other room in your house, once it’s organized, it doesn’t take long to clean." I recommend re-organizing your garage twice a year, in October/September and June.